Dance Commentary by Heather Desaulniers: "A Streetcar Named Desire"
A single amber-hued light bulb hung in the middle of the stage. Up center was a backdrop of an old Southern estate. A steel, deconstructed frame forged an inner proscenium arch. Eve Mutso as Blanche DuBois embarked on a solo, contained within a small square of light. A prelude of sorts, the variation ebbed and flowed with sinewy movements and a recurring motif - as Mutso’s hand approached the light, it trembled and shook. 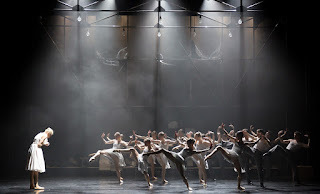 In Act I of the ballet, the viewer gets to experience the early parts of Blanche’s story, the events that are referred in other versions but rarely seen. Of course, with no text scenes during the ballet, it makes absolute sense that this would be the starting point as opposed Blanche’s arrival in New Orleans. It is the back-story, providing necessary context for understanding what happens later. In these early segments, we meet a different Blanche, one with a lightness and joy. This is apparent in her early pas de deux with Alan (Victor Zarallo), whom she marries. A lovely, courtly waltz follows their wedding, and motifs from it return again and again during the ballet, serving as reminders of a happier time and state of being.